I can totally relate to that. It is hard work keeping up friendships. You are right, the thought of meeting up friends and cooking up a storm does not seem exciting as did a few years ago when the kids were not around. We still do a fair bit of socializing and sometimes I miss not doing more but it certainly has come down what with the kids classes and what not. Cauliflower is one of those vegetables that is accepted without a murmur. Love this dry version. That gobi recipe is something i will try soon. never cooked roasting it, or even making that kinda tomato onion paste. but i do kasuri methi to gobi & love it. Weekend is much precious time spent with my family. I don't even pick up my phone to call any of my friends and his friends. Like the roasting idea with kasoori. About ur previ post, I am in that group of ur neigh who don't eat idli/dosa outside. Hmm u ve a nice neighb! Biryani and Pattu, what else we need? Hmm, looks good. I love all kinds of phoolkopi. Getting tired of my regular recipe and will try this hopefully this week. Maybe I should become your neighbour! You will gets load of praise for all your goodies ;-) Love to the little ones. Every weekend is the same for me. Get up at 6am (yes, I am always the first one to wake up and in the shower! ), make breakfast which is waffles and Bacon on Saturday, then eat lunch out and shop. Same again, pancakes and Hash browns on Sundays, make special lunch and do some gardening, watch movies and there goes the weekend. Arvind is on call 1 into 2, so every other day and weekend he is on call anyway. I can relate to you with this. kasoori Gobi looks very delicious Sandeepa. Virtual social networks haven't made me a recluse. I'm fairly new at it, I have both real-life and blogger friends on it and haven't ditched real conversations and meetings with real-life friends for virtual ones - in fact, it's one more aspect to the real-life relationship. I don't work in the strict sense of the term, but I do have a few commitments during the week.Recently, i was discussing with Dinesh if we were becoming too anti social! The truth is, the weekends are so precious. With the kids growing up, there is also their growing load of homeworks, which does take up quite a chunk of the weekend, after which the mind needs a serious break. I am not the hostess with the mostest, but we used to host get togethers quite often , but that has come down considerably.Blogging is a nice respite and like Asha, I too love to go back to my quiet corner, any day,and don't mind being alone. Sandeepa, i have been following ur blog silently from quite a while ... I just love the writeups and the recipes that follow..
oh sandeepa..do not feel guilty! i do not have kids..but when i work i am a social recluse too...actually i am also a recluse when i am on a diet..feel i have put on weight...or just like that! i am a lil moody...so i need my 'me' time on a regular basis...it is different for me now...coz i am sitting at home looking for a job and bored to death! There is not much social activity as in US here but I manytimes have invited people for lunch or dinner and do not know many promise but don't turn up. As I too work the weekends are for he kids. I plan for one outing, time for homework for the kids and cook special dishes for the entire family. I reserve the Sunday afternoon for my baking experiments as the kids will be having a nap. Usually bake for thir snacks boxes for the entire week. This kasoori gobi is gorgeous and the idea of roasting them in the oven is really nice. Need to try this. Now she is a teenager hurray there is more freedom for us. I have cut back seriously on socializing sine last year, one weekend a month is just about enough for me. Throw in S's class mates B'Day parties too and almost two weekends every month you are going out and meeting people. "when i was hoping that there are leftovers"
Bow to thee. Here I crib because I have to get up at 5:30 on weekdays and so sleep in late on weekends. You are so disciplined to wake up the same time very day. You are one social butterfly :) Whom did you meet in Goa, ahhh Aparna ? That I think is very rude, accept and not turn up !!! Good atleast you work 5 days a week:). I have chess classes on saturday's so has to get up and get ready, just rush to have some cereal and get out by 9.30, get back around 2pm, but the best part is SV cooks on saturday's, 3 dishes are mandatory depending on his mood and excitement one more dishes is added to the menu, eat lunch and relax, both boys help each other to do stuff around the house. evenings are really busy either go out with nish/weekend socialization once in 2-3 weeks go to edison for grocery shopping. sundays are lil relaxed as I getup late most of the time its brunch, cleanup cook, prep for the weekdays!! I'm desperately waiting for a break. mostly summer I will. weekend i feel like having just brunch and then doin something which relaxes me,...be it anythin..:-)ya it can be cookin too at times,..
thnks for the recipe,..wil give this one a try,.. I think both N and I are becoming more anti-social with age! N more than me. I would like to meet people at least once a month or so but N is quite happy without even that! These days, we try to fit in a kid related activity every other weekend. With a full time job, 2 kids, cooking, cleaning et al i can understand why you'd want the weekend to be less stressful. Kasuri Gobi looks wonderful! These days, i seem to add kasuri methi in most curries! Love the flavor. haha - none of your recipes have failed me yet! BTW, is that kishmish in the kopi? That is unusual - so do you not add a bit of sugar to this recipe? I'm a loner from the beginning,but I do look forward to my weekends, there was a time when I worked EVERY weekend at the hospital for 12 hr shifts....and missed out on so much! Now...I need to spend the time with the kids. I am not one for parties, and social events, they bore me...so what I do is i take some out for the kids each weekend for a few hours, and then, a few hours for myself and kartik. We do fun things and not worry about anyone else.....which to me is just fine! Few close friends are important...yes, they keep us sane! chin up girl...it gets better each day. Gobhi looks good, I've never baked it before. so its occasionally that we end up going to friend's place or..aar weekend E sodho amra barista te boshe , golpo korte bhalo bashi , keno na tokhon hi amaar hubby kache ekto -addo samay thakhe ..
karoke deke aar onek rokom kore ranna kore khababar moton patience aar neyi amader !! Hi Sandeepa,I hop into ur blog every now and then coz I do love bong food.Loved the kasuri gobi and will try it this week,roasting in the oven sounds good. Well known strangers-u have coined a perfect phrase,its the same here in Adelaide,I know hoardes of them and its not worth wasting time and culinary effort on them,the close friends however are special and to be nurtured in all ways-after the family of course. I even liked ur gajjar sandesh. Kasoori gobi sounds new to me. All the pictures are breathtaking, awesome clicks. Hi Sandeepa, it has been a long time since I visited your blog. I was googling for some recipe and then landed onto your site. Only then I realised that I have missed your earlier posts. It is quite refreshing to read your posts, you have this knack of putting things in a neat conscise way. Enjoyed it. We have never been the "big togethers" kind but yes, cooking up a big spread for friends is something I enjoy but have been doing less of these days. We do meet friends more frequently but necessarily over food. Last weekend was fun having Sra here. 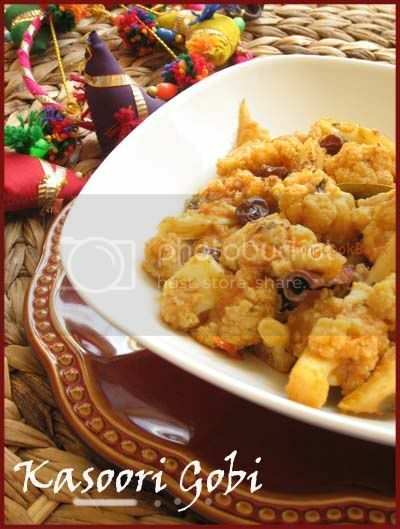 Never cooked cauliflower with kasuri methi, so should try this out. weekends are our time to catch up with friends but also to laze around... and it's hard to get the right balance :) the gobi looks great Sandeepa!